All Comers record and PB for Sarah in St Patricks Day 5k. 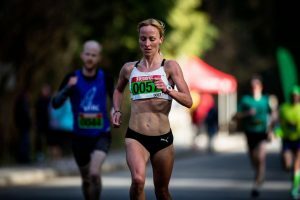 Sarah Inglis claimed a Canadian All-Comers Record in a 5K race in Vancouver on Sunday – as she moved up the Scottish all-time list in fine style.The Lothian Running Club athlete, ran a superb 15.29 in the St Patrick’s Day race in Stanley Park in Vancouver. Inglis was also involved in a photo finish for the opening mile at 4.44 with American athlete, Shalaya Kip, losing out on the verdict on that one with Kip later to finish third over the longer distance. It was second-placed Natasha Wodak’s time from the same race the previous year which Sarah broke. Sarah’s time of 15.29 takes her to third on the Scottish all-time list with only the legends that are Liz McColgan-Nuttall and Yvonne Murray-Mooney having run faster in 5K road races. ‘I went for it over the opening mile with Natasha and Shalaya and then just tried to keep going,’ said Sarah.